SACRAMENTO, Calif. (KFSN) -- A California Assemblyman announced Thursday that he's running for governor in 2018, an uphill climb for a Republican in a state dominated across statewide offices by Democrats. 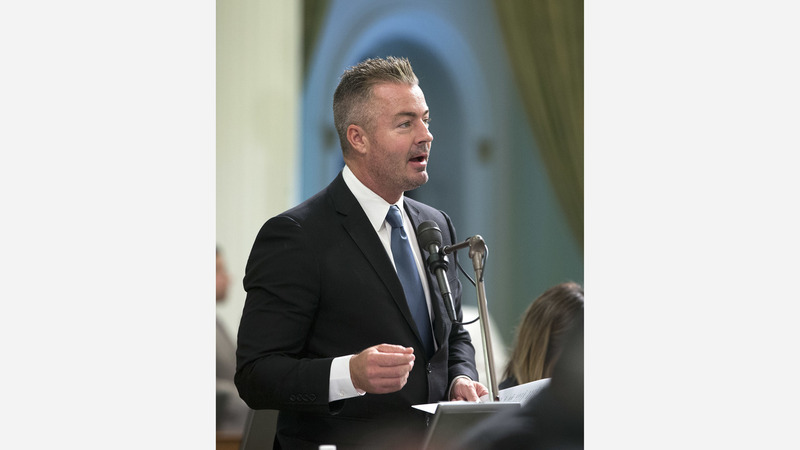 Assemblyman Travis Allen of Huntington Beach said while the numbers are not in his favor, he's running because Democrats have controlled the state for too long, enacting burdensome tax increases and policies that are soft on crime. Allen is leading a ballot initiative to repeal the gas tax increase approved largely by Democratic lawmakers earlier this year. "Over and over again I hear the same failed policies and tired excuses," Allen told The Associated Press in an interview. "There is a myth in California that the Democrat party is invincible." Forty-five percent of California voters are registered as Democrats while just 26 percent are registered Republicans. Democratic candidates Lt Gov. Gavin Newsom, Treasurer John Chiang and former Los Angeles Mayor Antonio Villaraigosa have generated the most buzz in the governor's race so far. All have raised millions of dollars for their campaigns. Venture capitalist John Cox, a Republican, and former state schools chief Delaine Eastin, a Democrat, are also running. Allen has served three terms in the Assembly representing a predominantly Republican coastal district in Orange County. In the Legislature, he's often a vocal opponent of regulations and tax increases. In May, Allen launched a ballot initiative campaign to repeal the gas tax hike approved by lawmakers and Gov. Jerry Brown earlier this year. The campaign hasn't yet been approved to begin collecting signatures. It must collect more than 365,000 signatures by December to qualify for the 2018 ballot. But Allen said the ballot measure campaign has already raised money from thousands of donors. Fixing California roads should still be a priority, Allen said, but instead of raising taxes, he would cut the number of government workers and pay them less. Allen said he would also reverse the hostile stance the state's Democratic leaders have taken toward President Donald Trump's administration. Legislative leaders have vowed to lead the "resistance" against Trump's immigration, environment and health care policies. Allen said he would cooperate more with the president. He announced his run via Facebook. "I believe that California's leaders should communicate directly with the people of California and not hide behind their political party or friendly press," he told AP. "Californians deserve straight talk and real solutions." Allen previously worked as a financial planner. He earned a bachelor's degree in economics at California State University Long Beach.